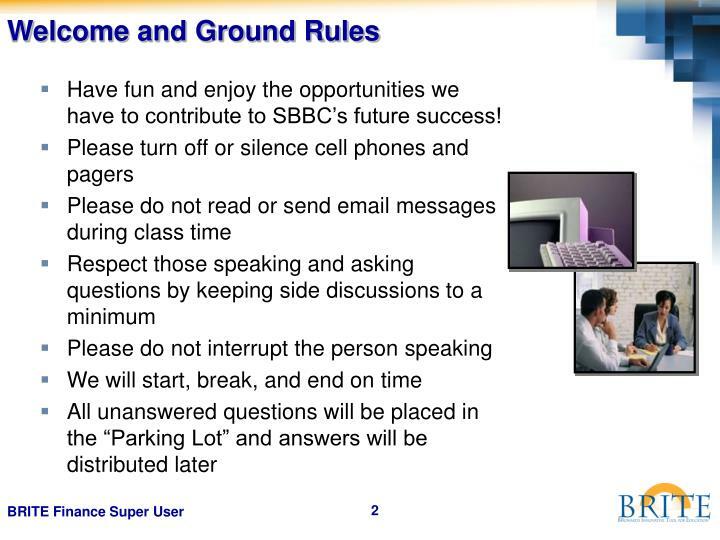 Have fun and enjoy the opportunities we have to contribute to SBBC’s future success! 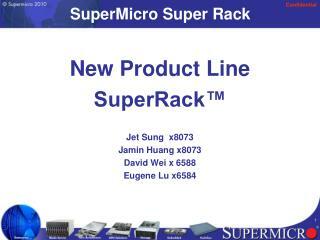 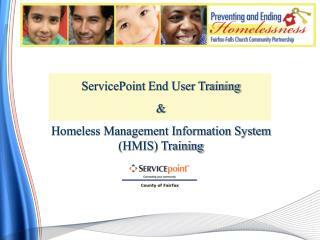 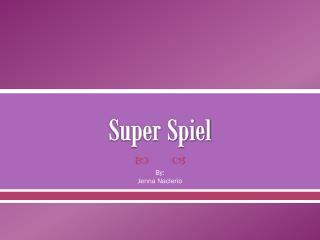 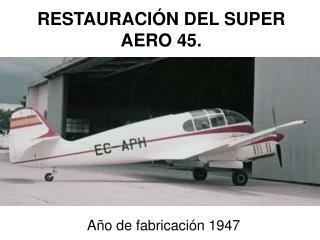 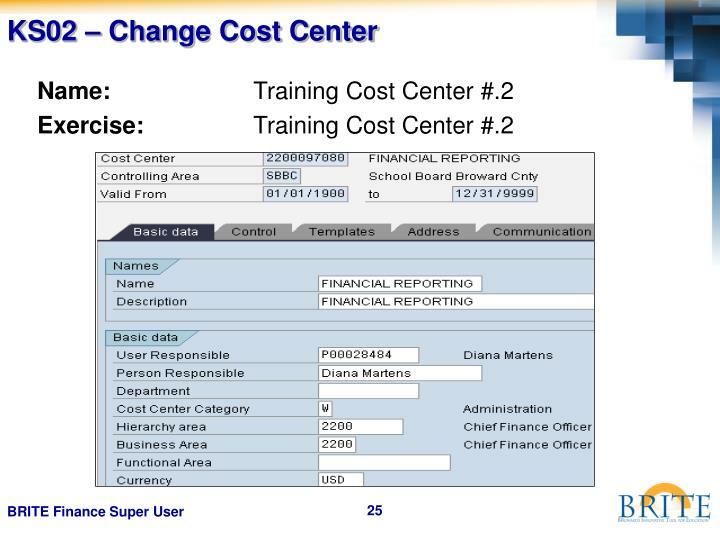 It provides staff with access and real-time data in the latest version of the SAP software. 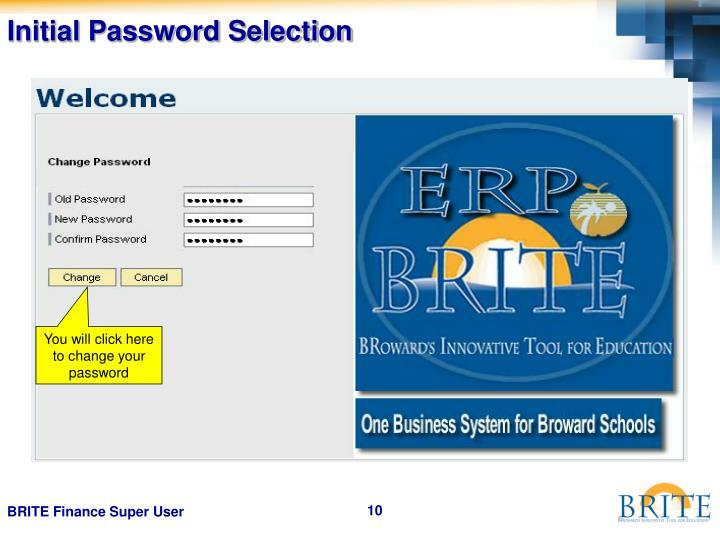 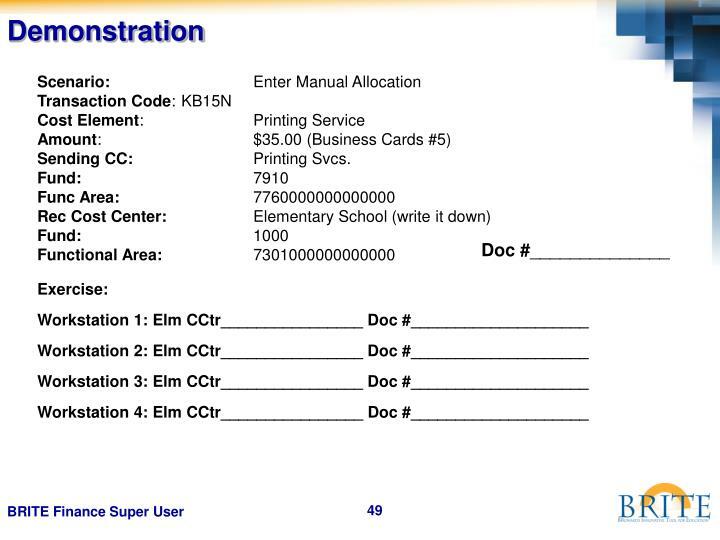 BRITE brings one business system to Broward Schools. 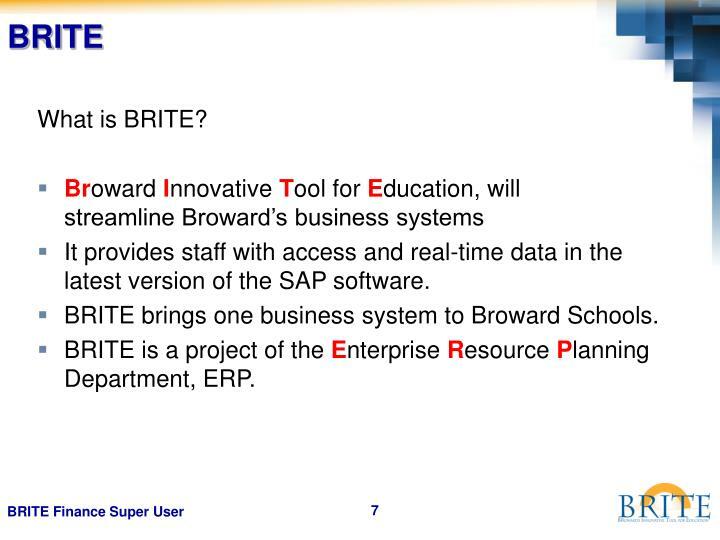 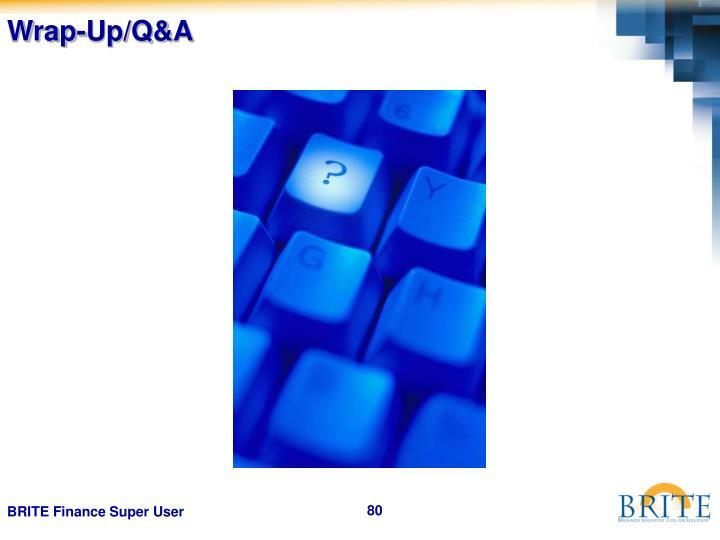 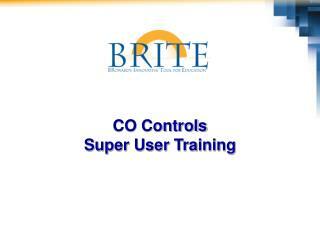 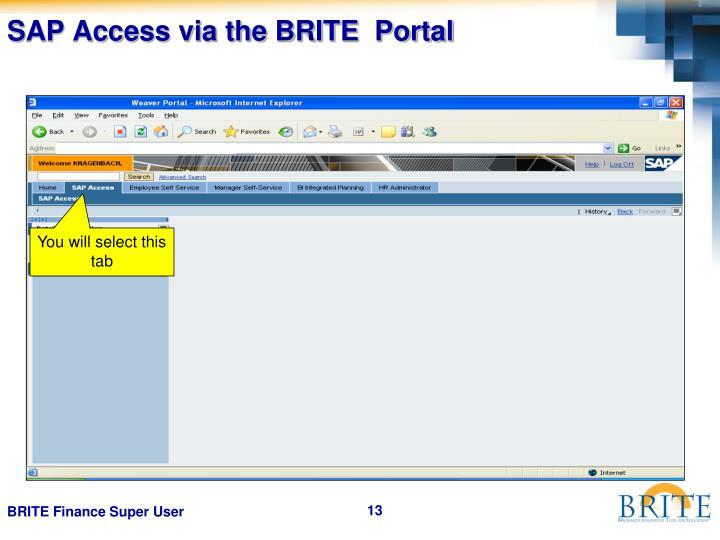 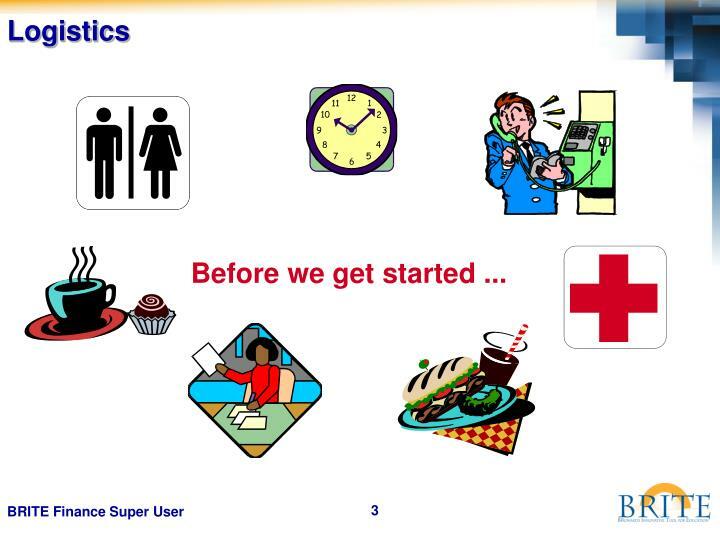 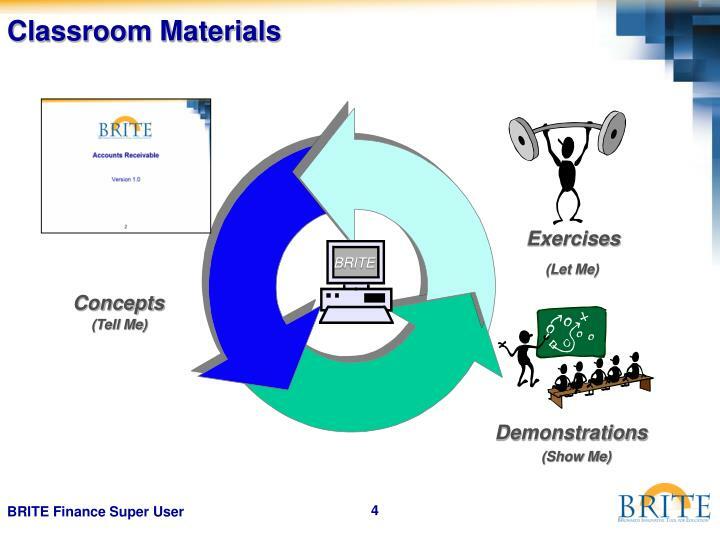 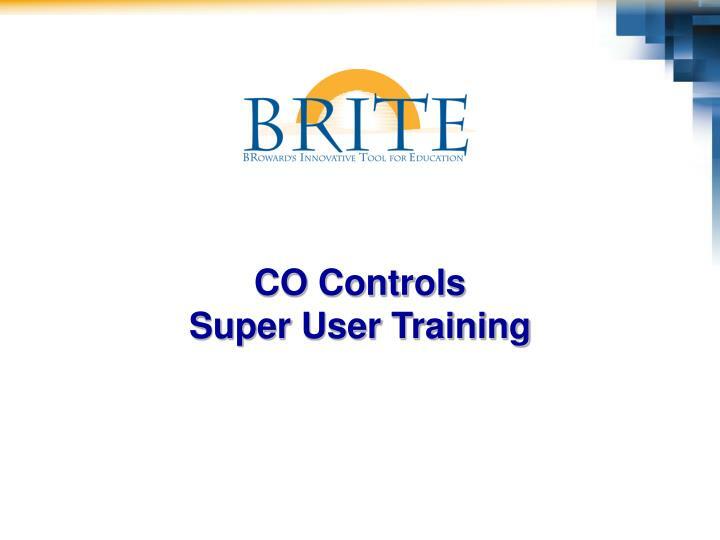 BRITE is a project of the Enterprise Resource Planning Department, ERP. 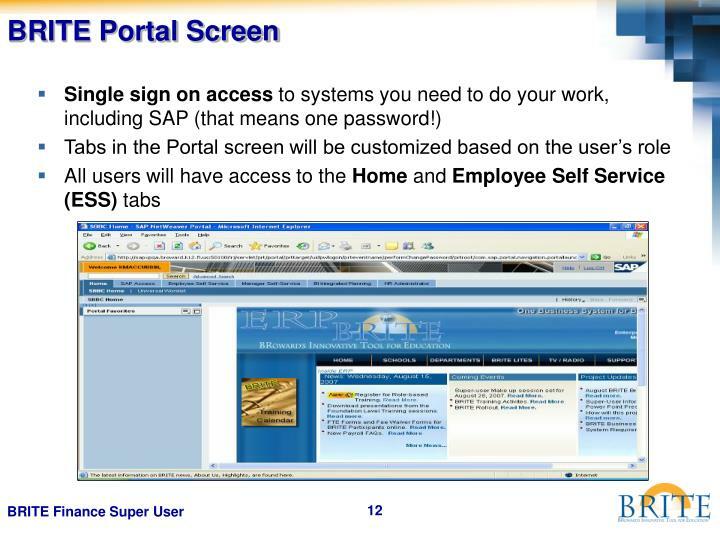 For end users, SAP will now be accessed through the web. 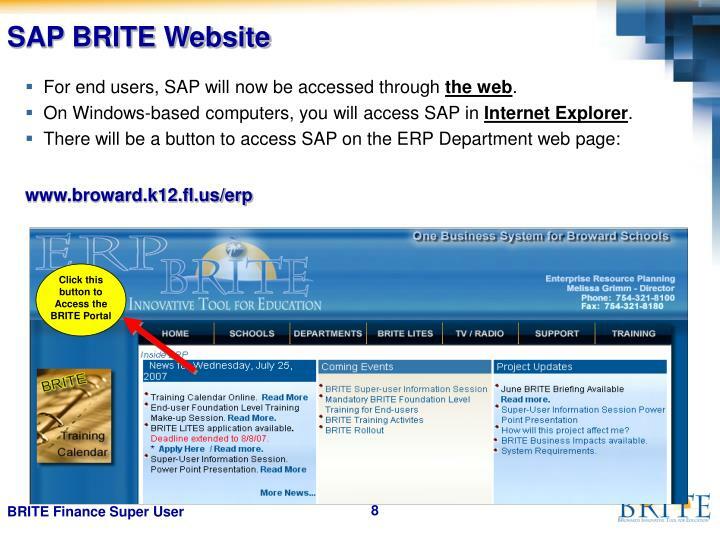 On Windows-based computers, you will access SAP in Internet Explorer. 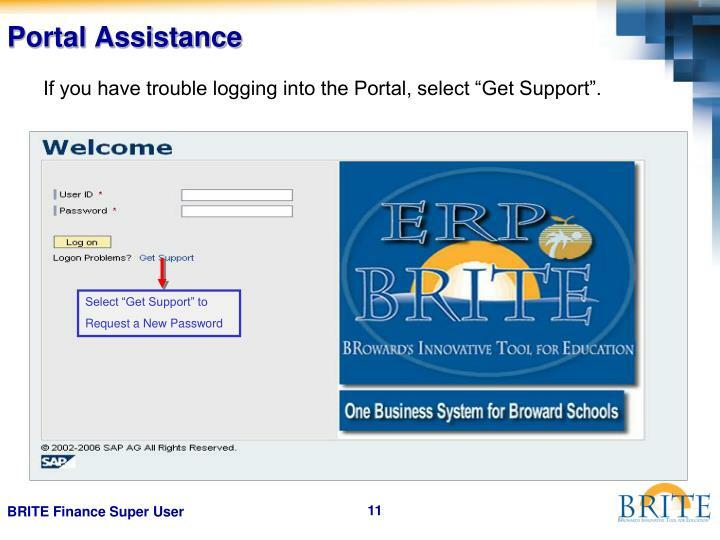 If you have trouble logging into the Portal, select “Get Support”. 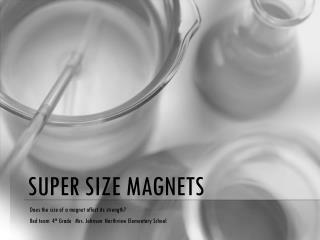 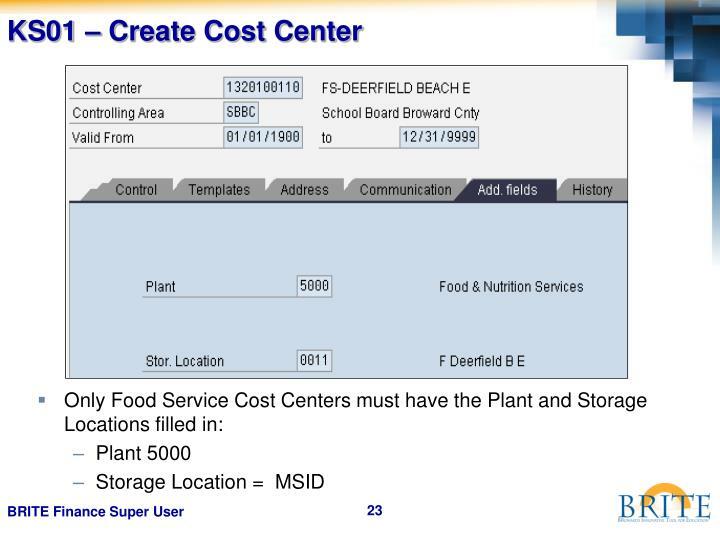 Use this procedure to establish the Controlling Area for the CO module used the School Board of Broward County. 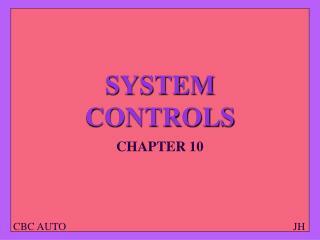 Perform this procedure when the Controlling Area has not been set. 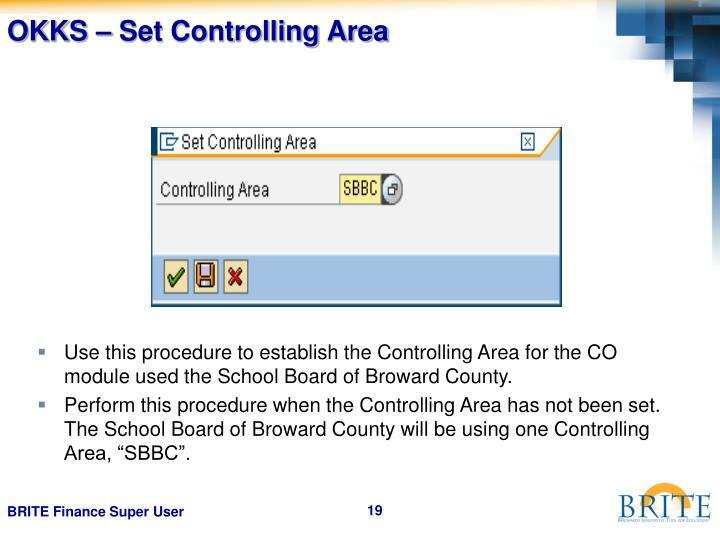 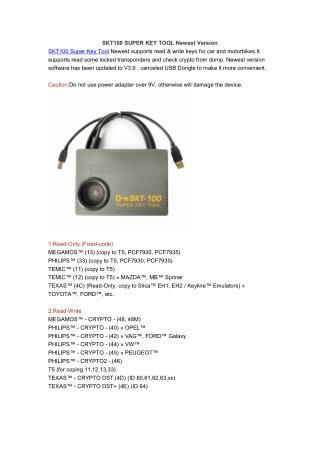 The School Board of Broward County will be using one Controlling Area, “SBBC”. 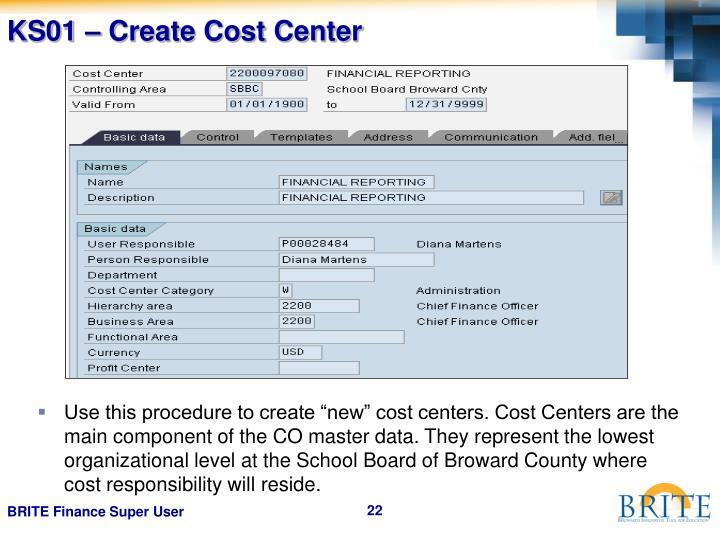 Use this procedure to create “new” cost centers. 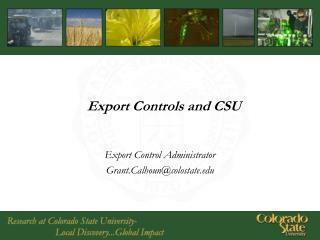 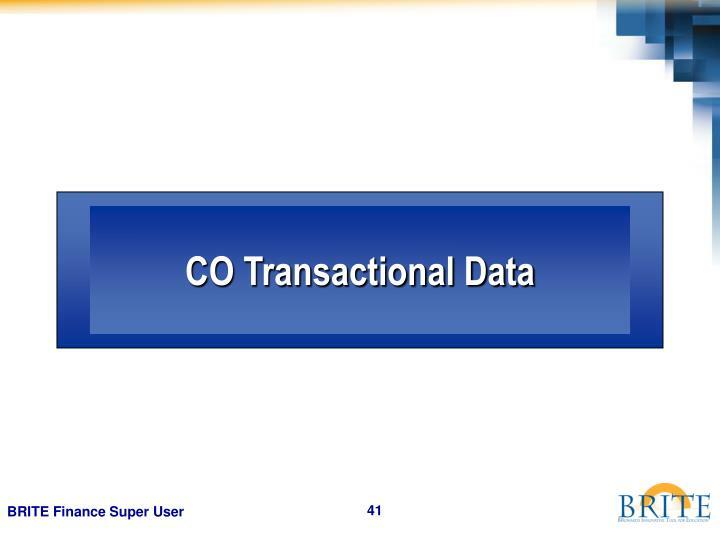 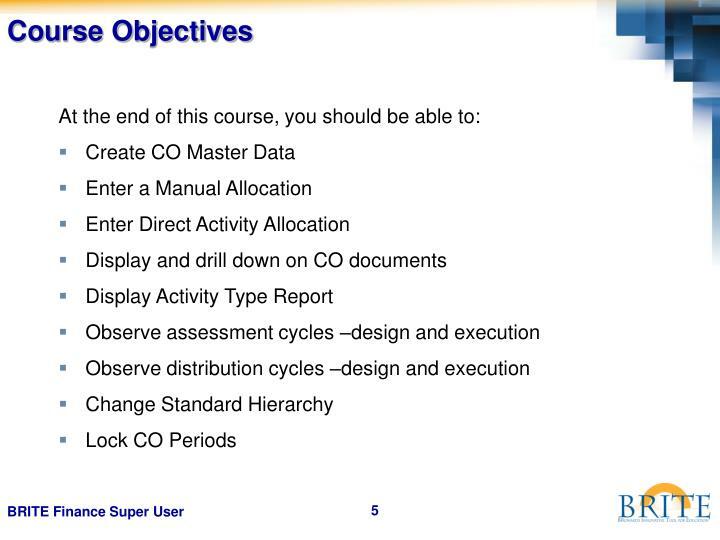 Cost Centers are the main component of the CO master data. 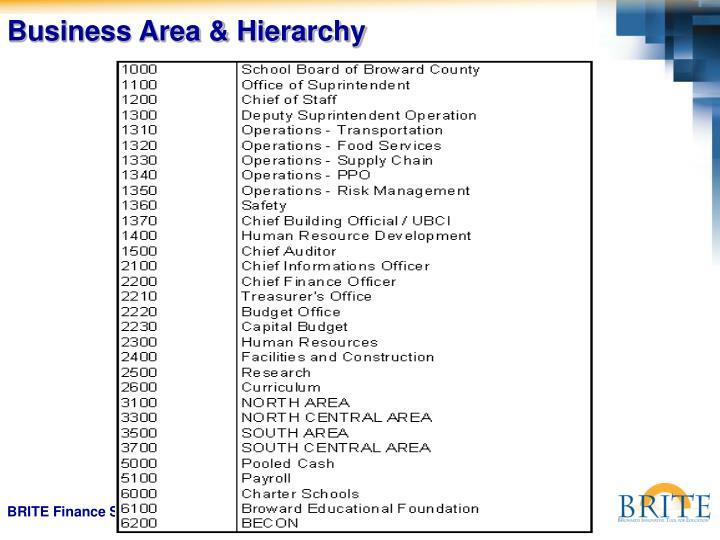 They represent the lowest organizational level at the School Board of Broward County where cost responsibility will reside. 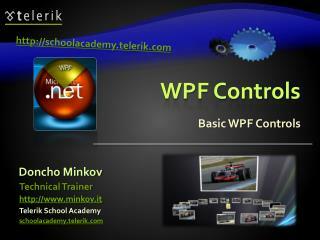 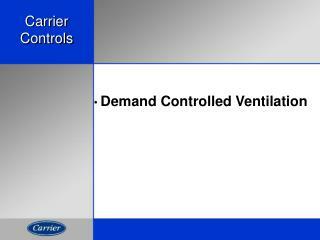 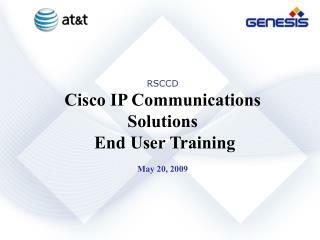 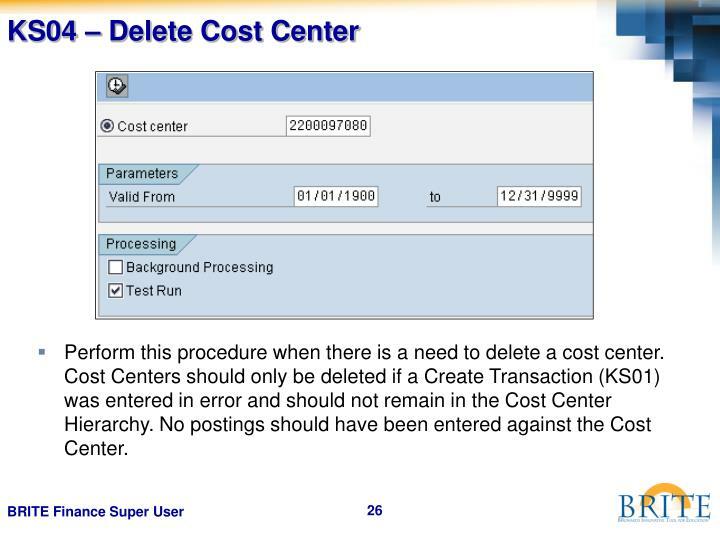 Perform this procedure when there is a need to delete a cost center. 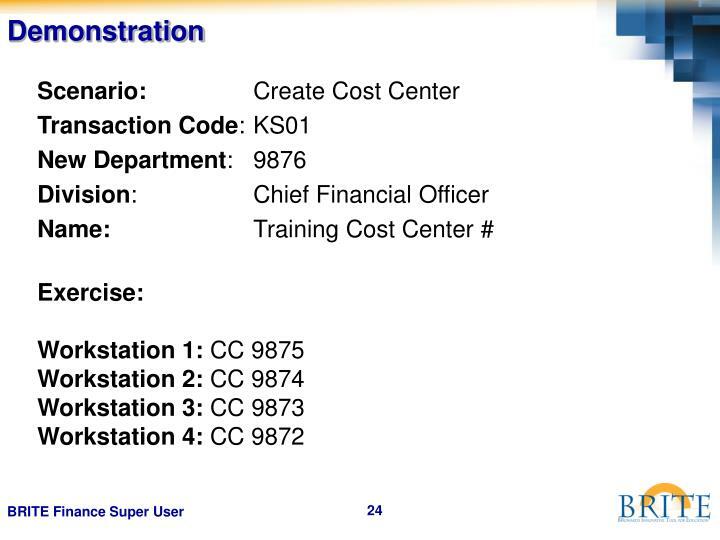 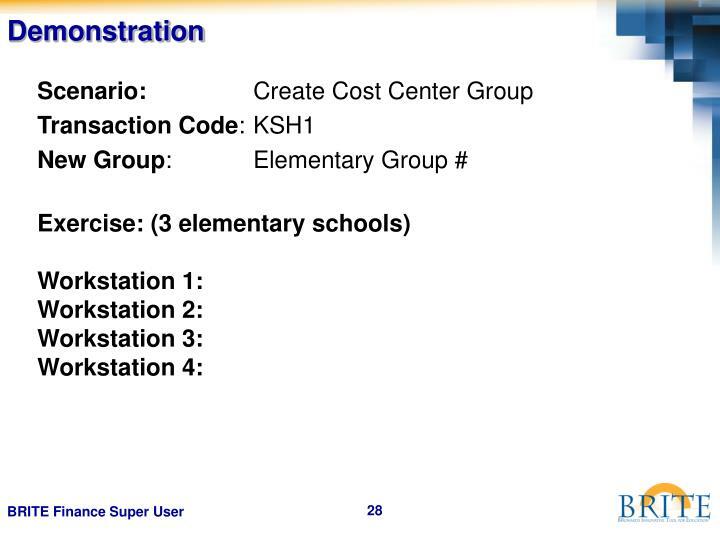 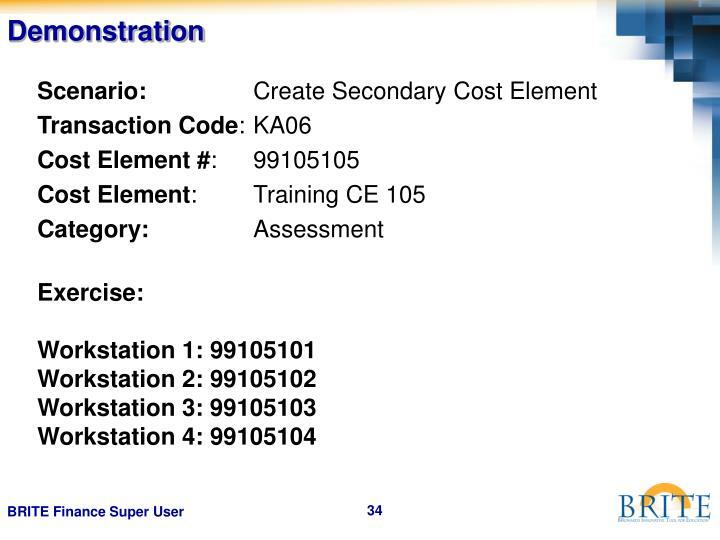 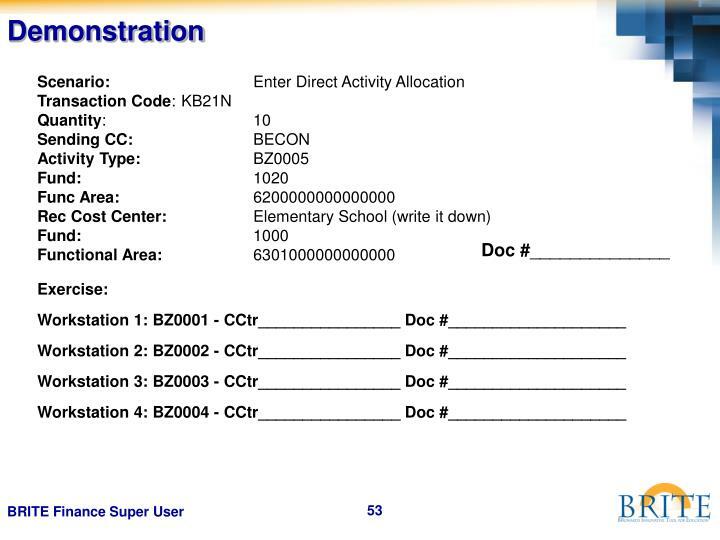 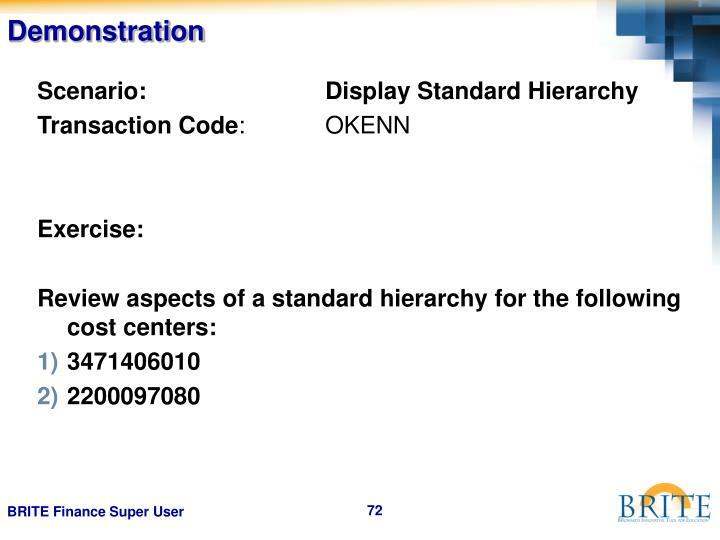 Cost Centers should only be deleted if a Create Transaction (KS01) was entered in error and should not remain in the Cost Center Hierarchy. 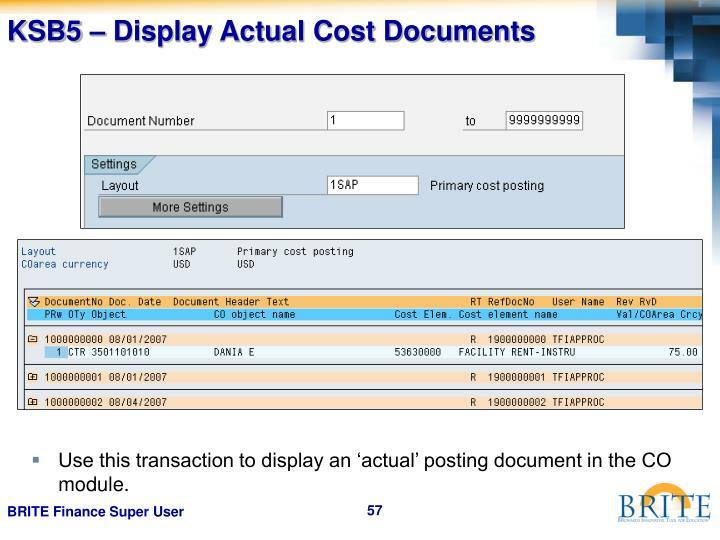 No postings should have been entered against the Cost Center. 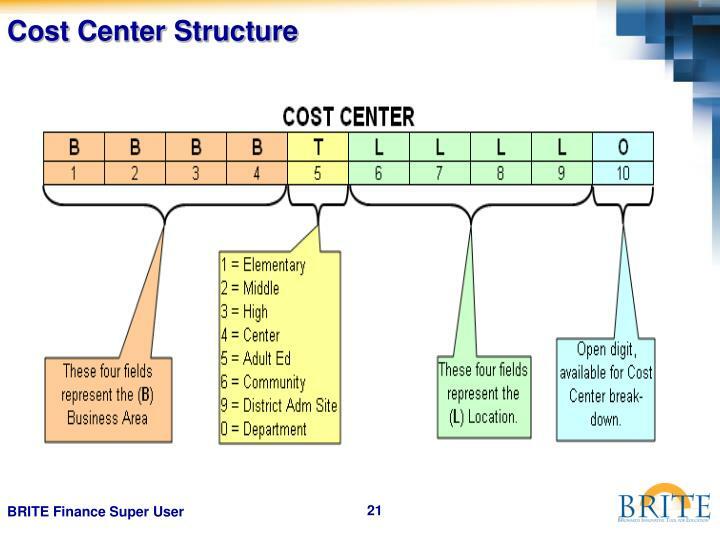 Use this procedure to build cost center hierarchy groups, which summarize the decision-making, responsibility, and control areas according to the particular requirements of the organization. 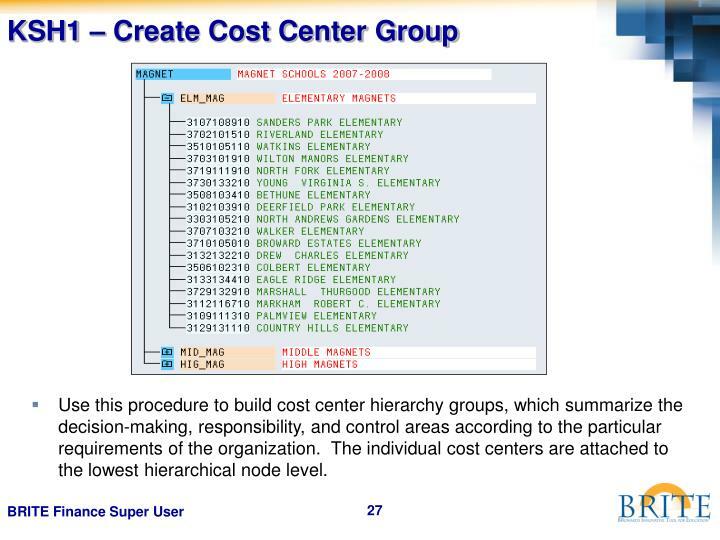 The individual cost centers are attached to the lowest hierarchical node level. 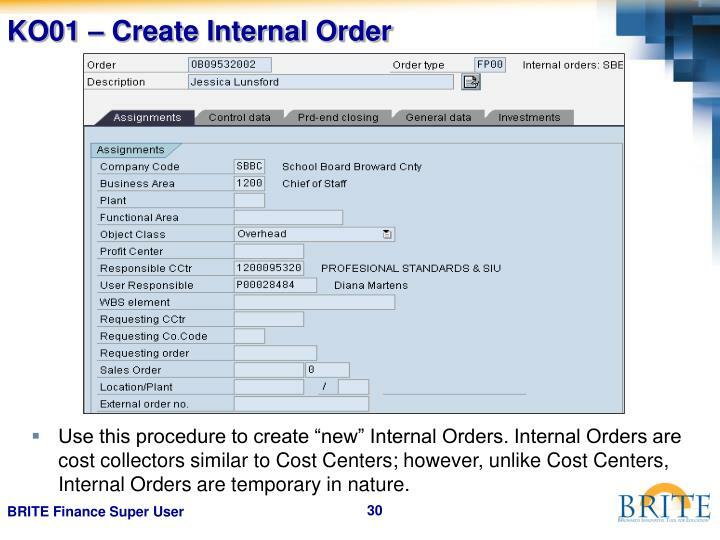 Use this procedure to create “new” Internal Orders. 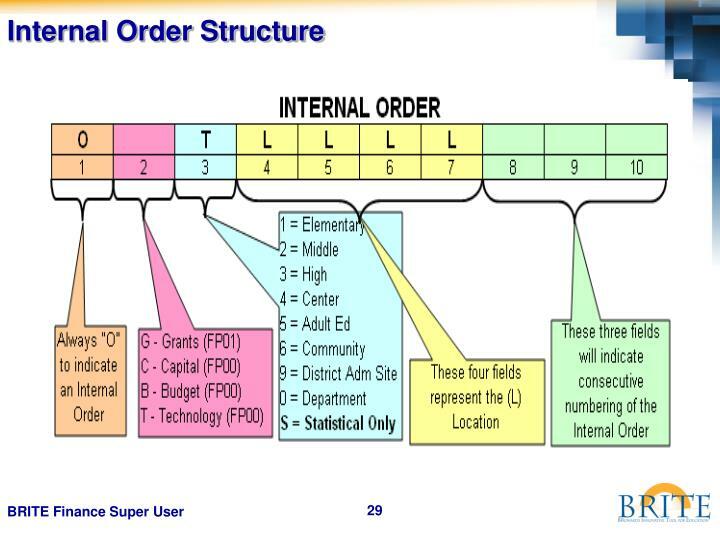 Internal Orders are cost collectors similar to Cost Centers; however, unlike Cost Centers, Internal Orders are temporary in nature. 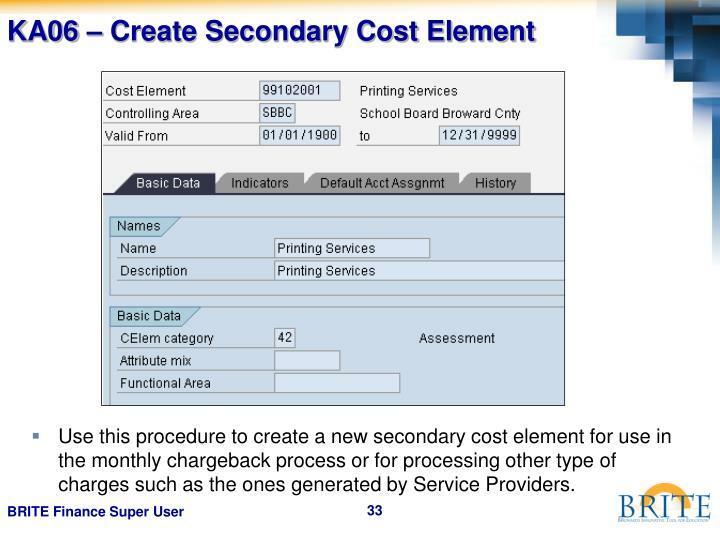 Use this procedure to create a new secondary cost element for use in the monthly chargeback process or for processing other type of charges such as the ones generated by Service Providers. 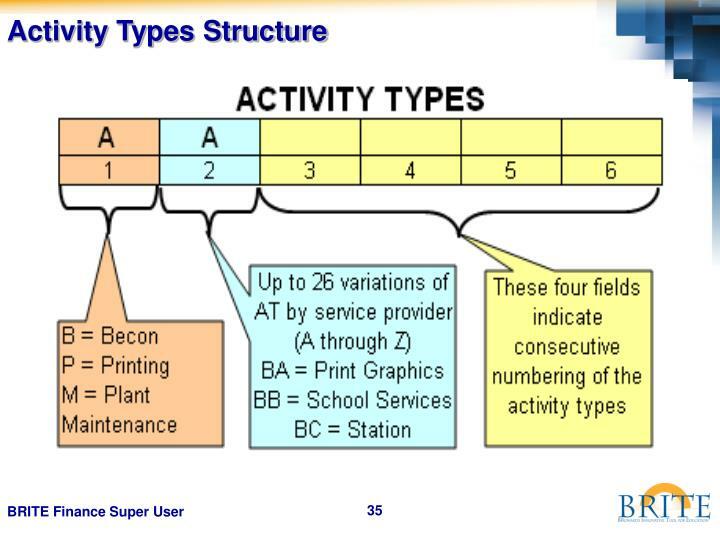 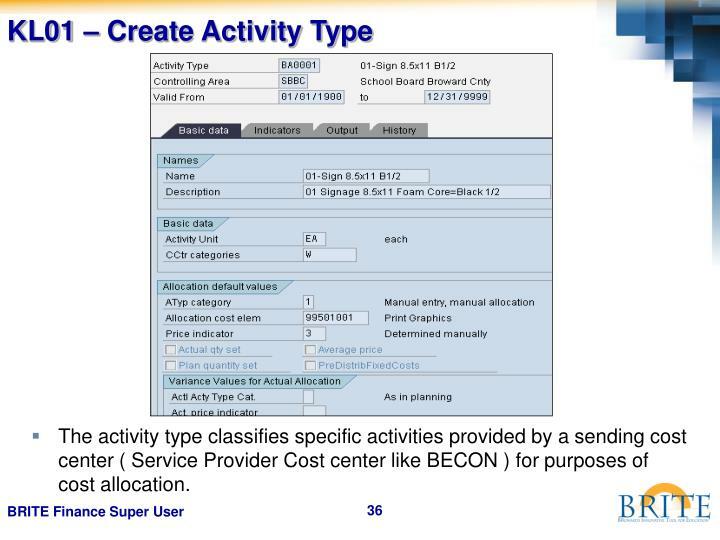 The activity type classifies specific activities provided by a sending cost center ( Service Provider Cost center like BECON ) for purposes of cost allocation. 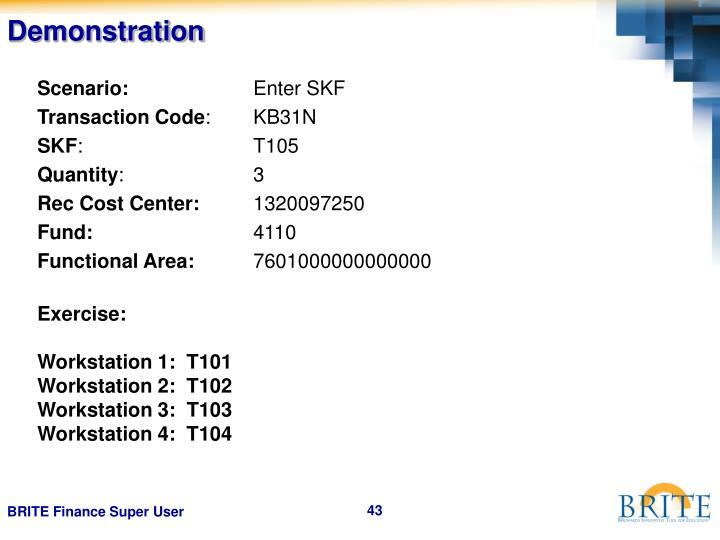 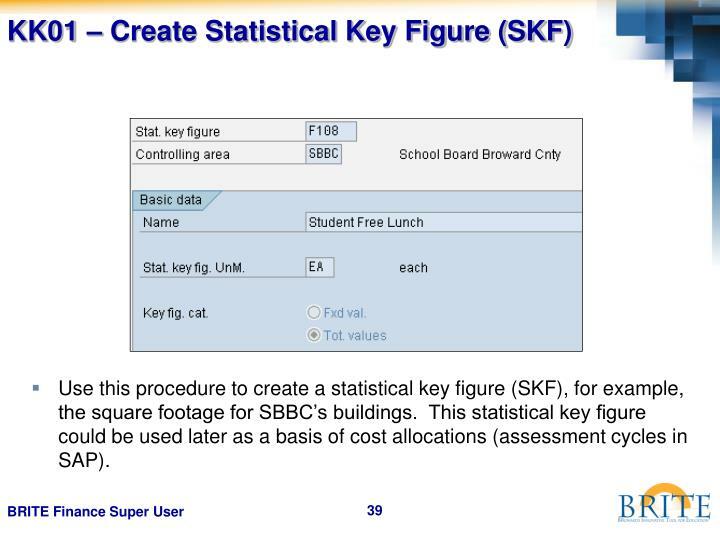 Use this procedure to create a statistical key figure (SKF), for example, the square footage for SBBC’s buildings. 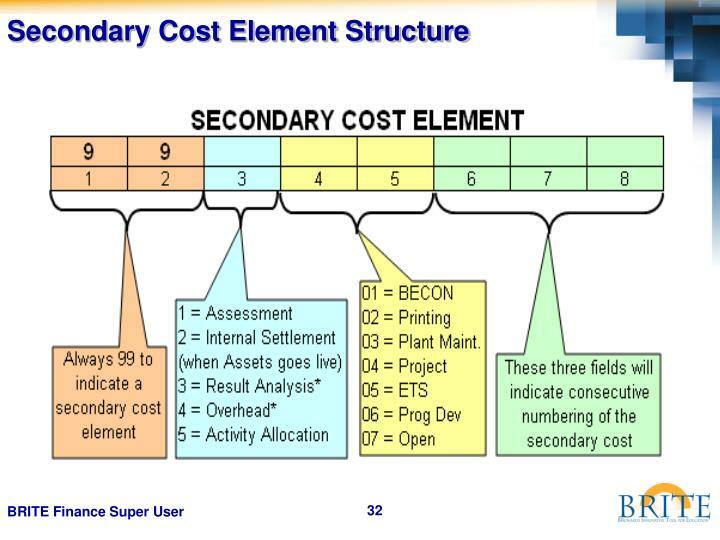 This statistical key figure could be used later as a basis of cost allocations (assessment cycles in SAP). 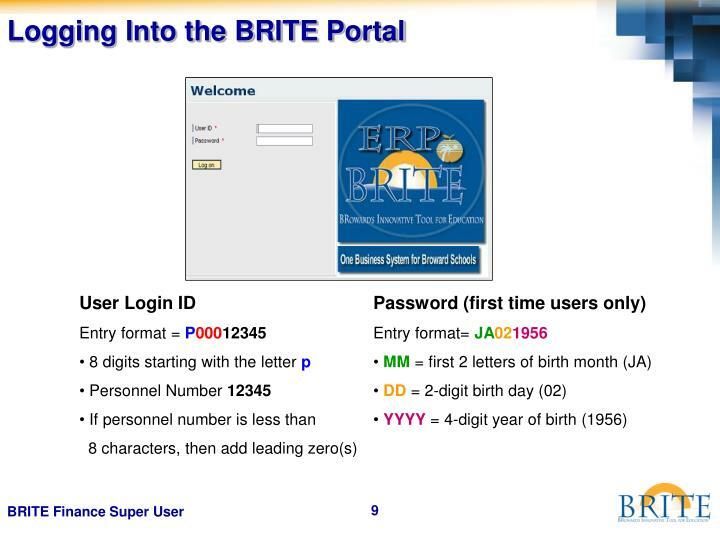 Use this procedure to enter (i.e. 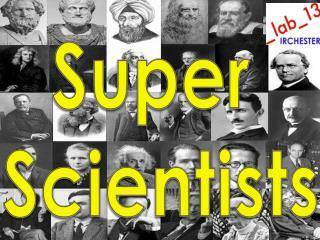 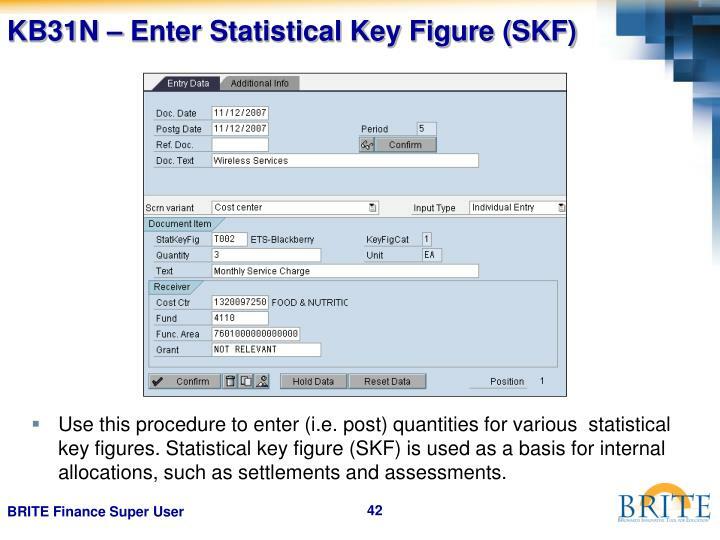 post) quantities for various statistical key figures. 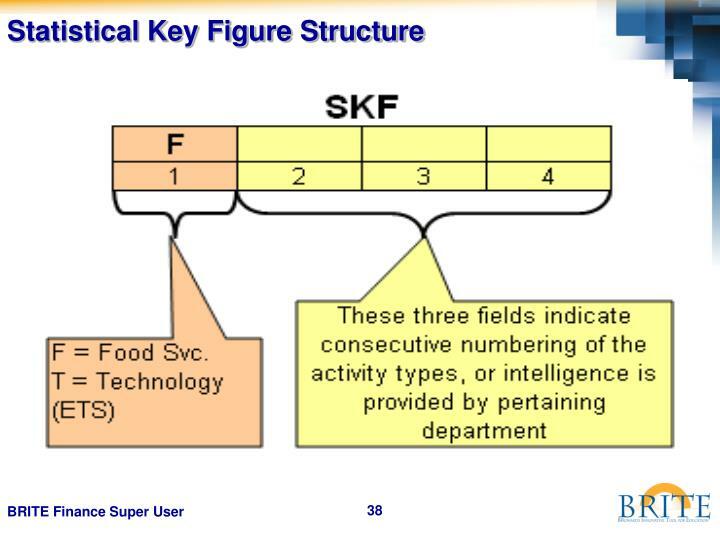 Statistical key figure (SKF) is used as a basis for internal allocations, such as settlements and assessments. 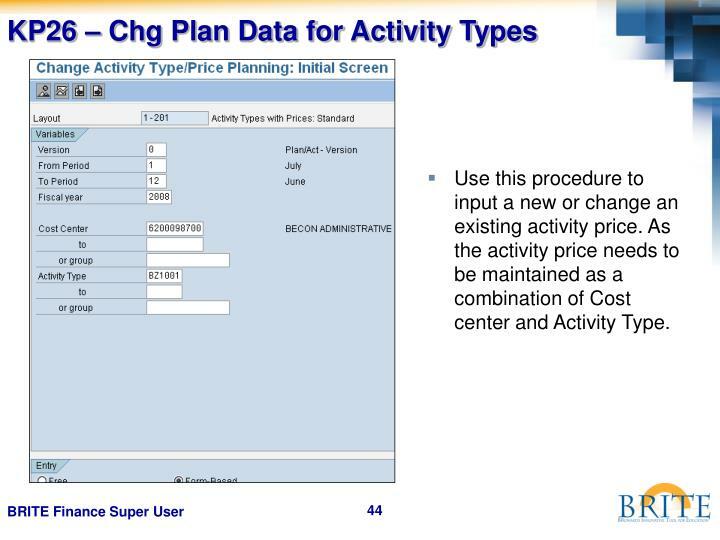 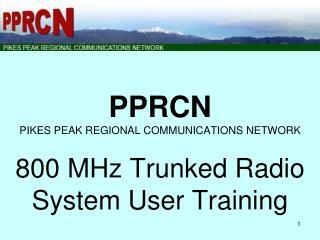 Use this procedure to input a new or change an existing activity price. 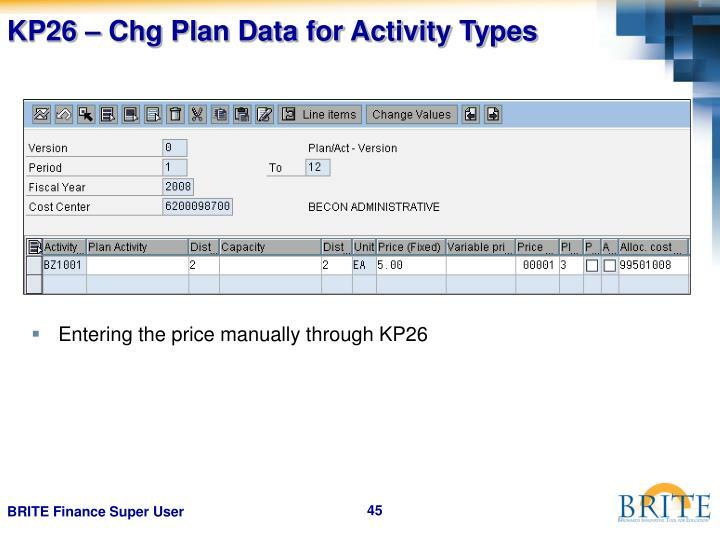 As the activity price needs to be maintained as a combination of Cost center and Activity Type. 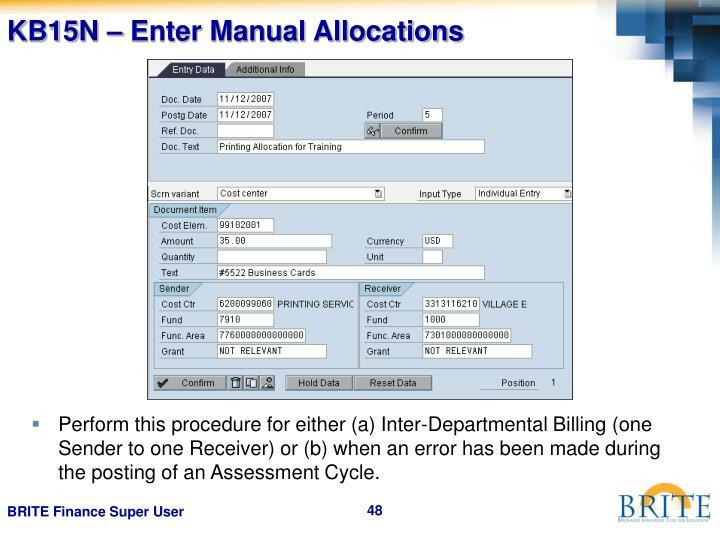 Perform this procedure for either (a) Inter-Departmental Billing (one Sender to one Receiver) or (b) when an error has been made during the posting of an Assessment Cycle. 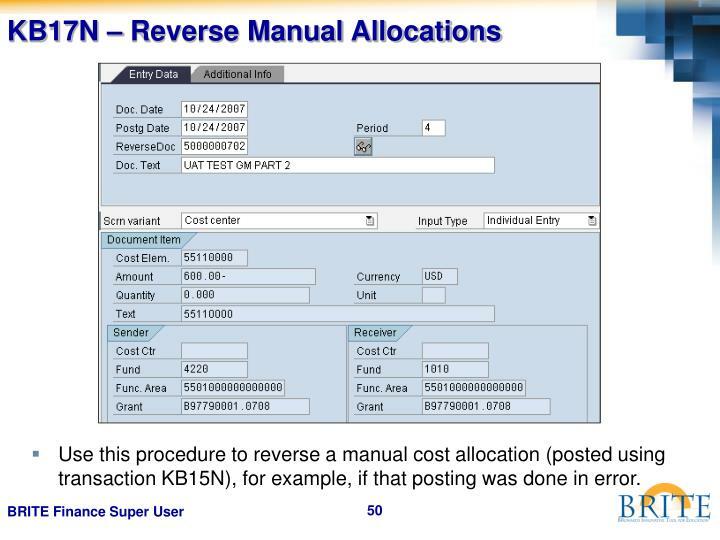 Use this procedure to reverse a manual cost allocation (posted using transaction KB15N), for example, if that posting was done in error. 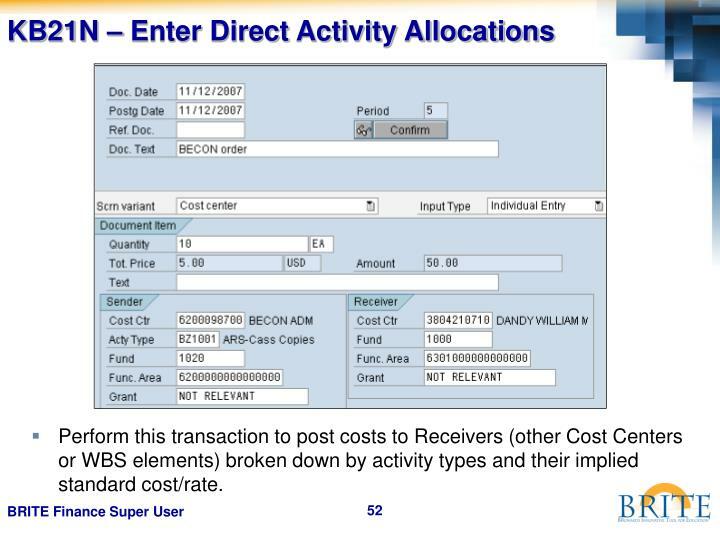 Perform this transaction to post costs to Receivers (other Cost Centers or WBS elements) broken down by activity types and their implied standard cost/rate. 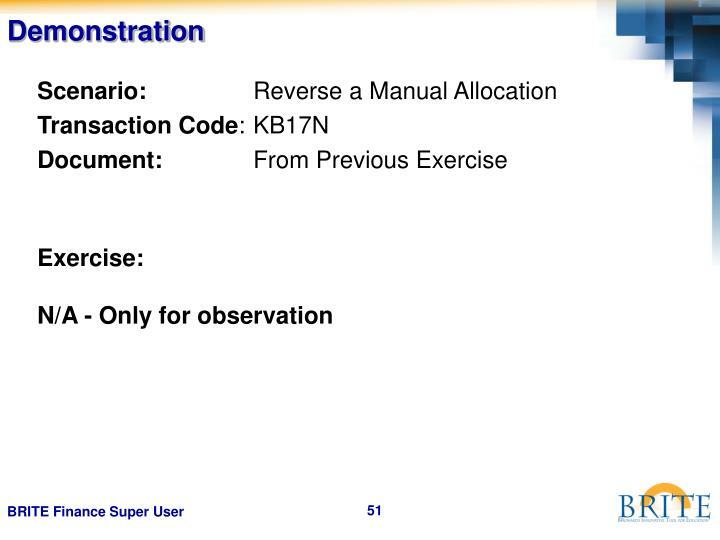 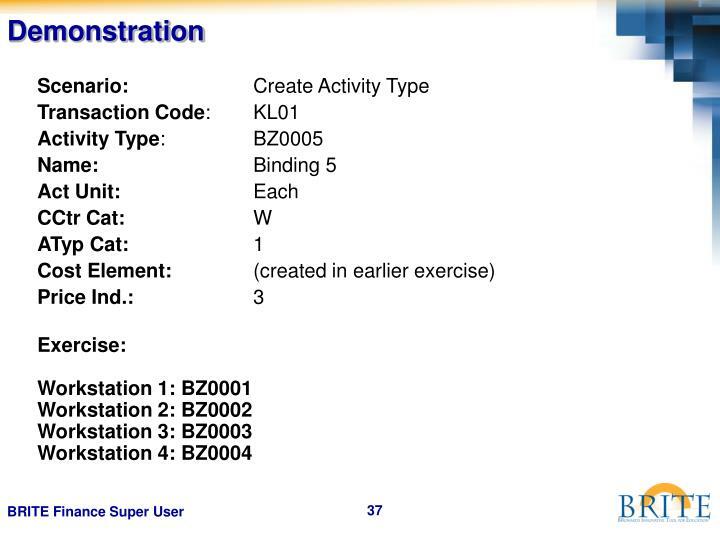 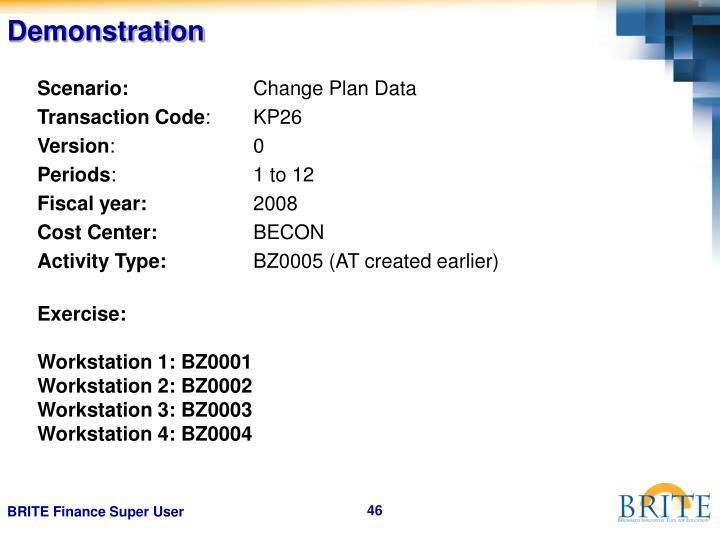 Perform this procedure when you have erroneously posted an activity allocation using transaction code KB21N. 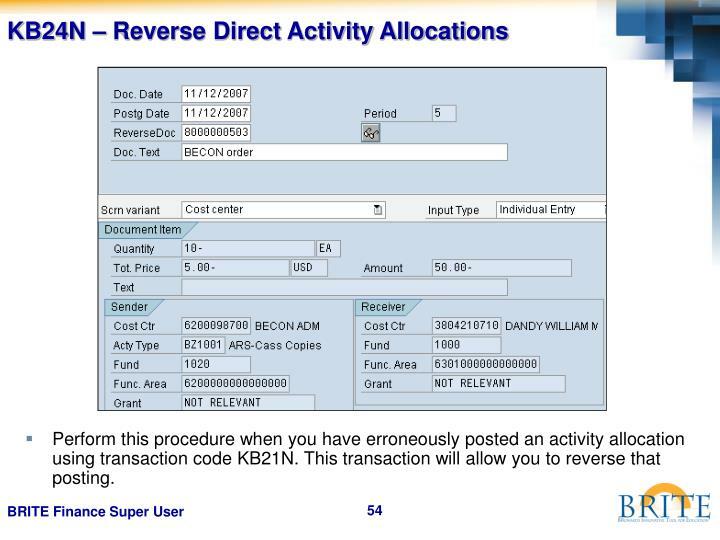 This transaction will allow you to reverse that posting. 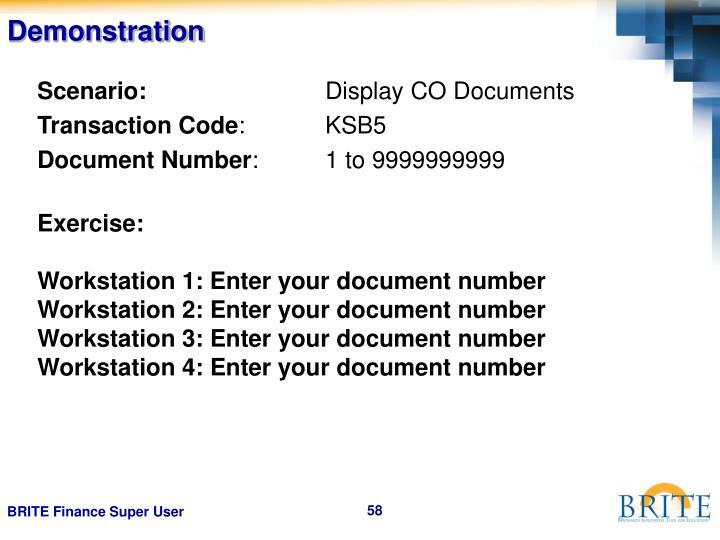 Use this transaction to display an ‘actual’ posting document in the CO module. 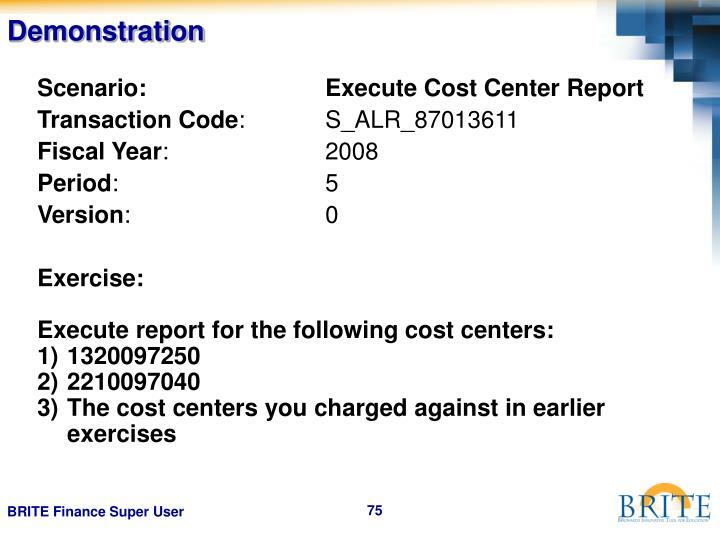 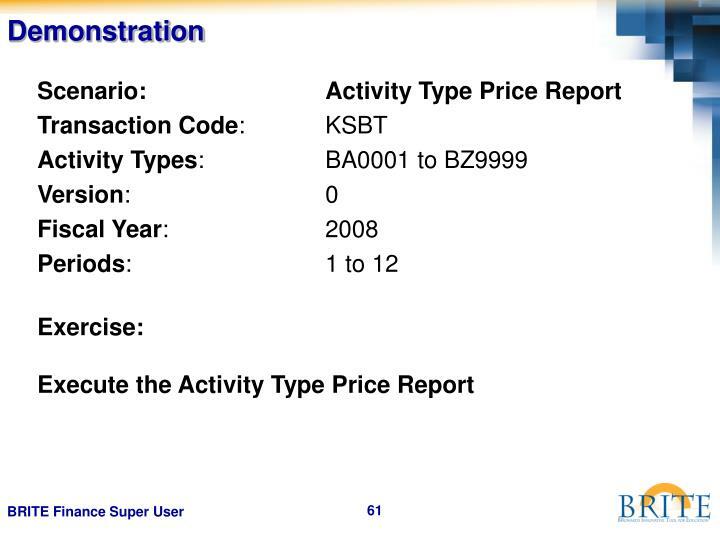 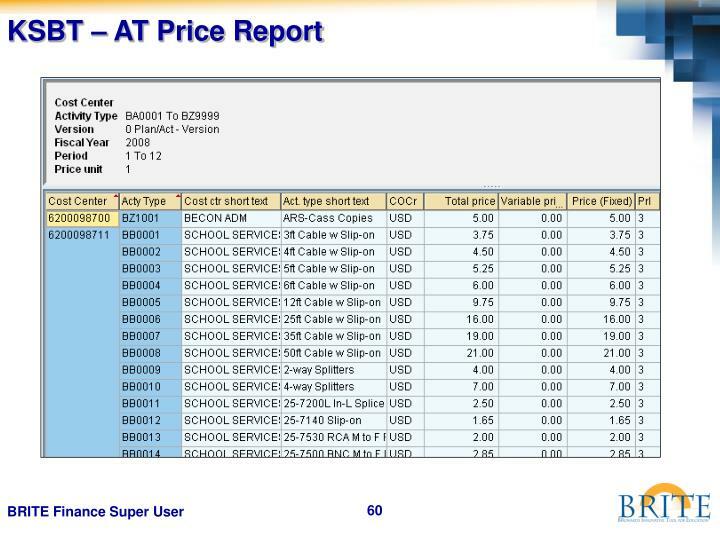 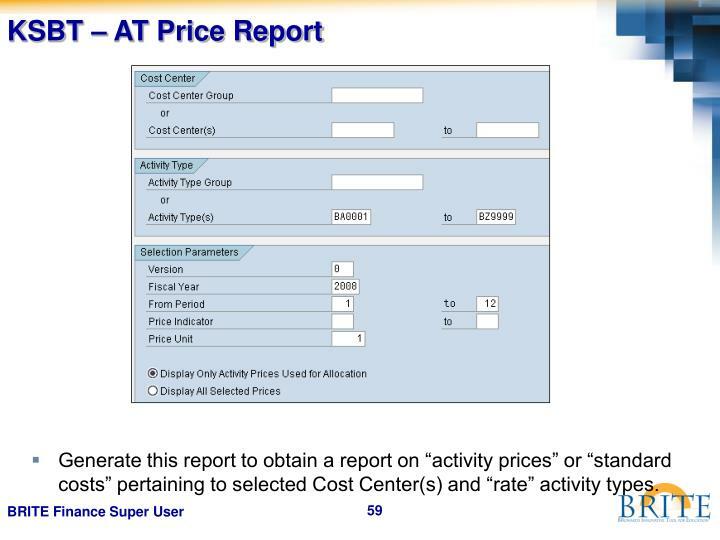 Generate this report to obtain a report on “activity prices” or “standard costs” pertaining to selected Cost Center(s) and “rate” activity types. 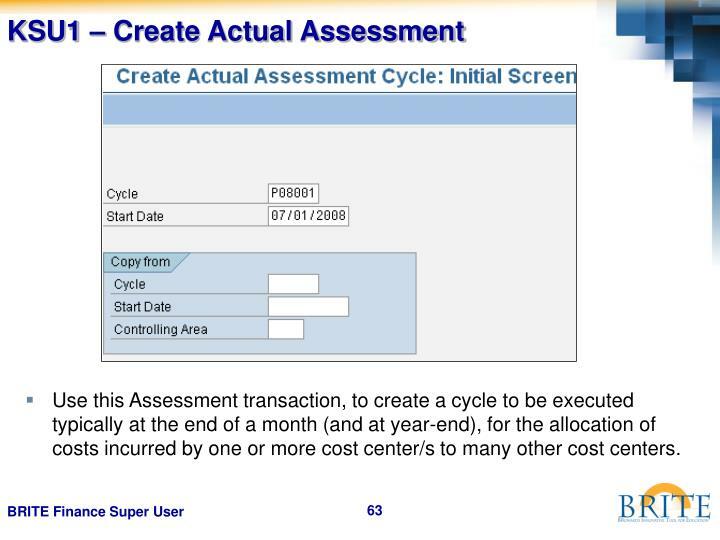 Use this Assessment transaction, to create a cycle to be executed typically at the end of a month (and at year-end), for the allocation of costs incurred by one or more cost center/s to many other cost centers. 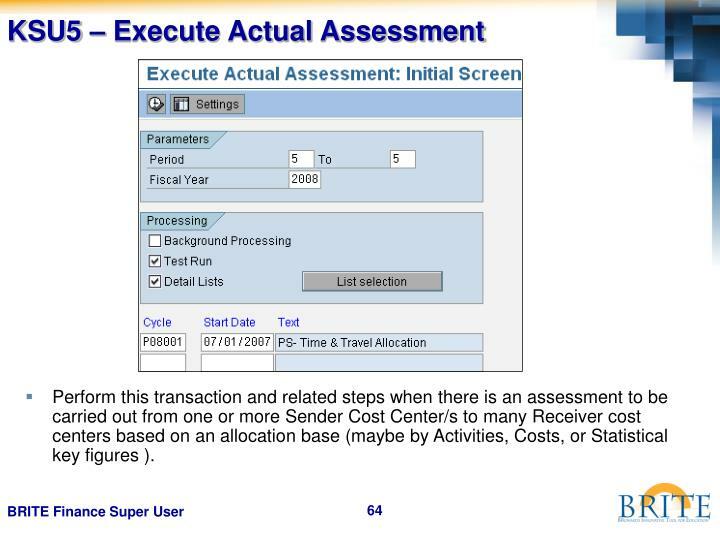 Perform this transaction and related steps when there is an assessment to be carried out from one or more Sender Cost Center/s to many Receiver cost centers based on an allocation base (maybe by Activities, Costs, or Statistical key figures ). 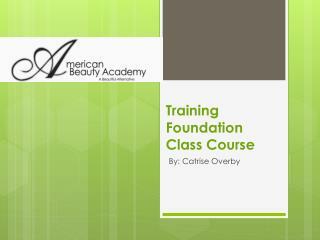 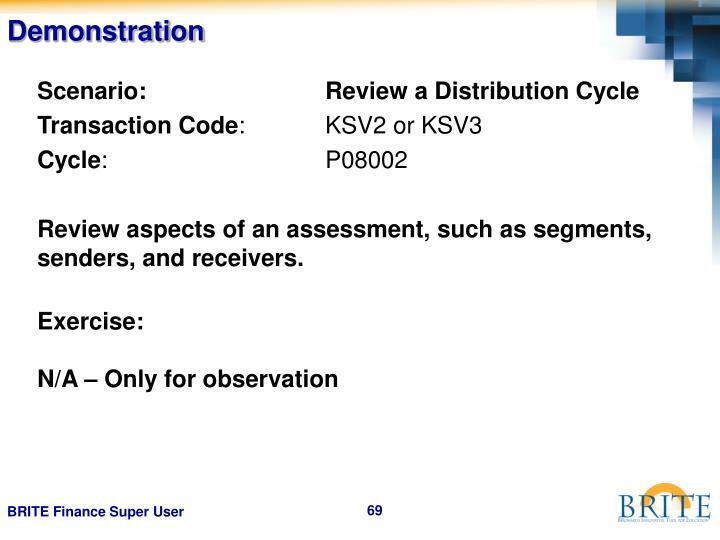 Review aspects of an assessment, such as segments, senders, and receivers. 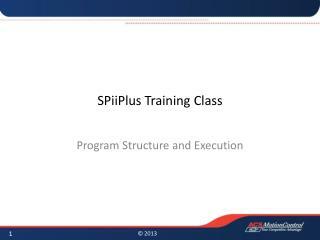 Use this Distribution transaction, to create a cycle to be executed typically at the end of a month (and at year-end), for the distribution of costs incurred by one or more cost center/s to many other cost centers. Perform this procedure when there are charges that need to be distributed from one or more Sender Cost Center (or Grant) to many other Receiver Cost Centers (or Grants). 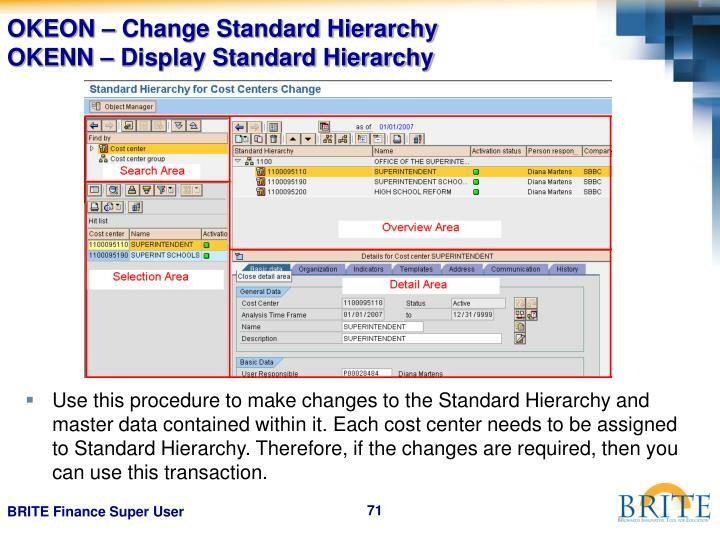 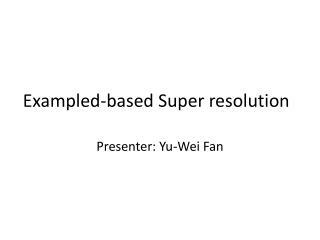 Use this procedure to make changes to the Standard Hierarchy and master data contained within it. Each cost center needs to be assigned to Standard Hierarchy. 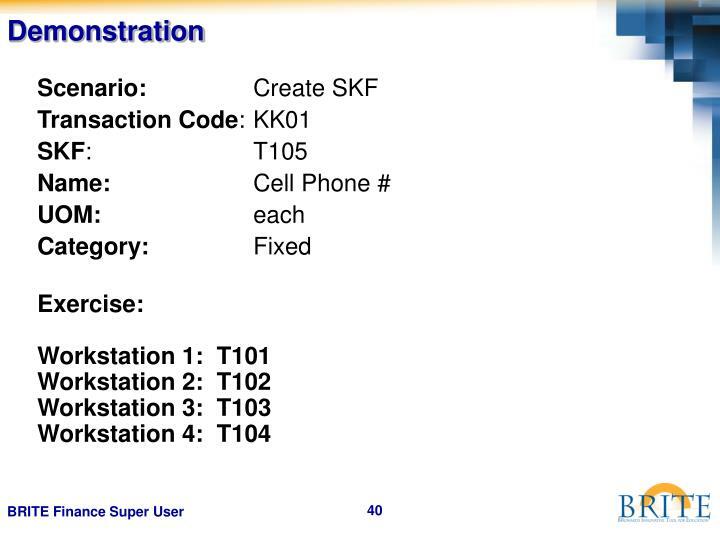 Therefore, if the changes are required, then you can use this transaction. 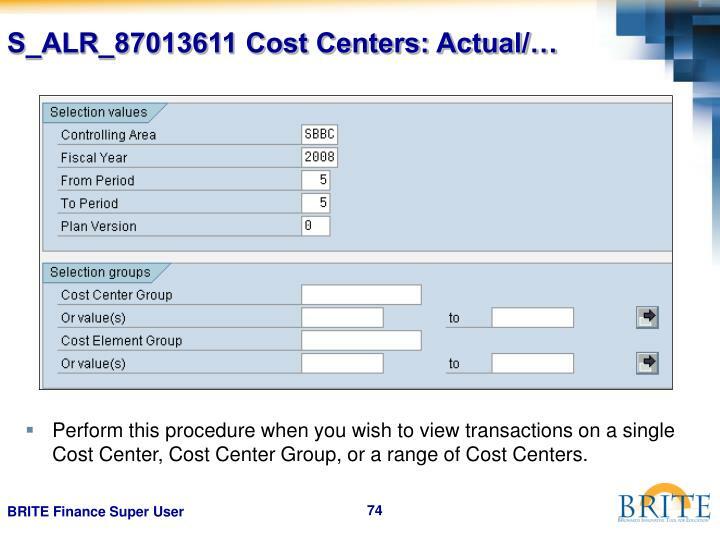 Perform this procedure when you wish to view transactions on a single Cost Center, Cost Center Group, or a range of Cost Centers. 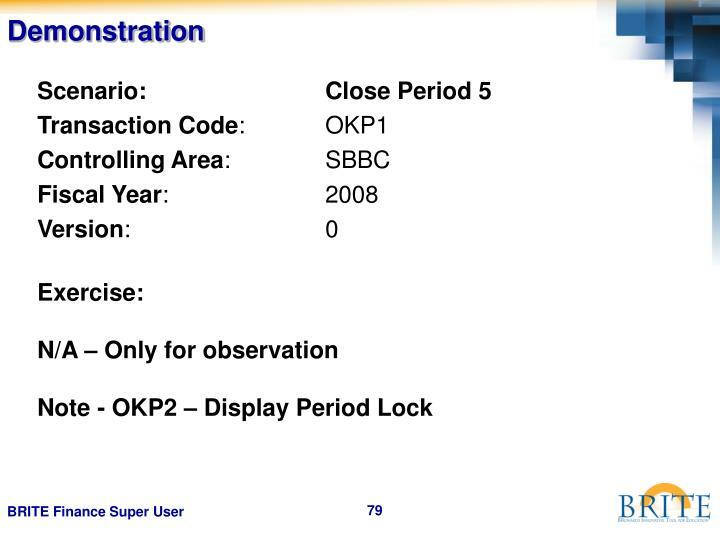 Use this procedure to open or close the month on the Controlling module/ledger. 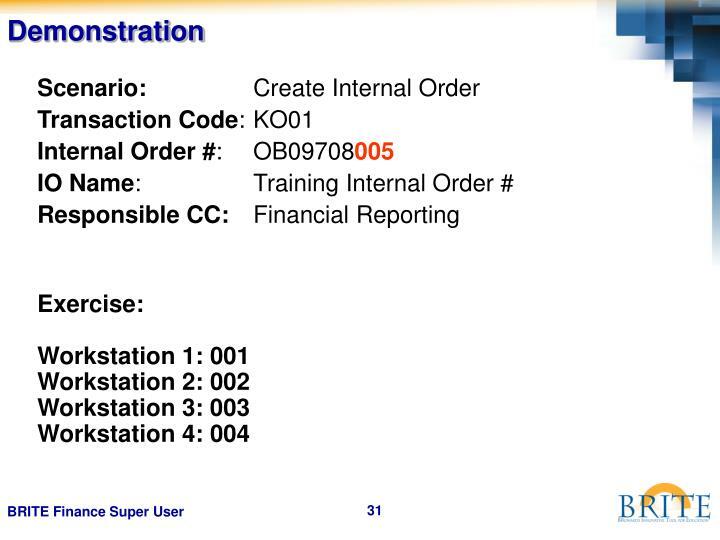 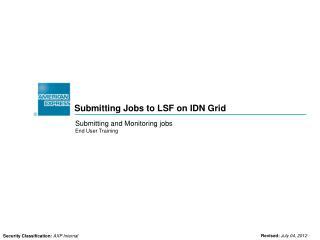 This will allow or block postings to the CO ledger, including through posting from FI module. 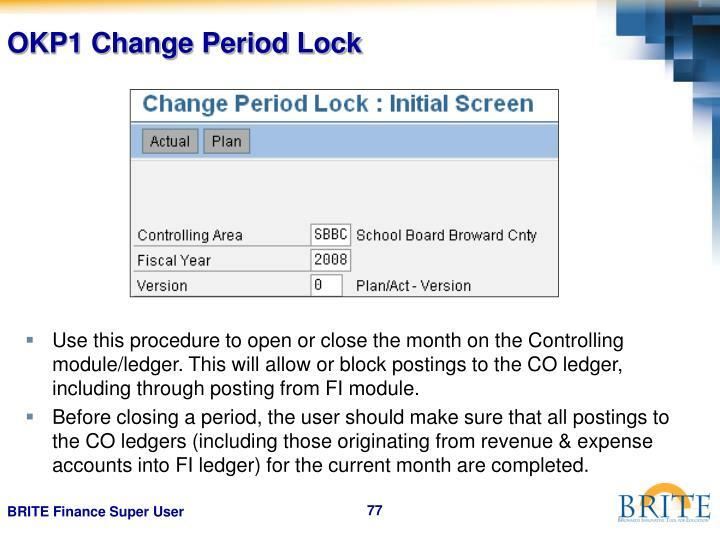 Before closing a period, the user should make sure that all postings to the CO ledgers (including those originating from revenue & expense accounts into FI ledger) for the current month are completed. 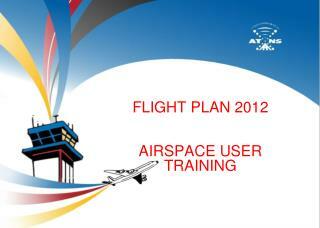 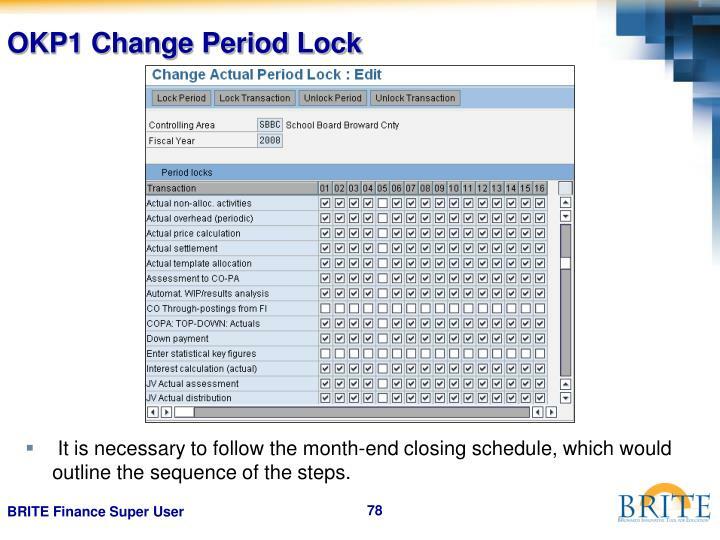 It is necessary to follow the month-end closing schedule, which would outline the sequence of the steps.